Gonzalo Higuain scored his 32nd goal of the season but was then sent off as Napoli lost 3-1 at Udinese to stay six points behind Serie A leaders Juventus. The Napoli striker appeared to push the referee and clashed with team-mates after a second booking on 75 minutes. The league's leading scorer earlier drove home a fierce shot to cancel out a Bruno Fernandes penalty. Fernandes saw a second penalty saved but made it 2-1 before Cyril Thereau added Udinese's third after the break. Napoli also saw coach Maurizio Sarri sent from the dug-out in the first half as their hopes of a first league title since 1990 suffered a major blow following Juventus' 3-1 win over Empoli on Saturday. Sarri was dismissed for protesting at the second penalty award, while Argentina international Higuain, 28, was booked twice in the space of 15 minutes. The second followed an innocuous-looking foul on Felipe and provoked an angry response from Higuain, who had to be restrained by team-mates as he looked to remonstrate with Udinese players. The defeat was Napoli's first in the league since losing to Juventus six matches ago. Sarri said: "We can't take anything away from Udinese, they played great while we just never got to play at our usual level. "The defeat will make us angry for a day or so, but it will also give us enough fuel for the next seven games." Match ends, Udinese 3, Napoli 1. Second Half ends, Udinese 3, Napoli 1. Ryder Matos (Udinese) wins a free kick on the left wing. Omar El Kaddouri (Napoli) wins a free kick in the defensive half. Foul by Stipe Perica (Udinese). Elseid Hysaj (Napoli) wins a free kick on the right wing. Attempt blocked. Manolo Gabbiadini (Napoli) left footed shot from outside the box is blocked. Assisted by Marek Hamsik. Offside, Napoli. Omar El Kaddouri tries a through ball, but Manolo Gabbiadini is caught offside. Attempt missed. Marek Hamsik (Napoli) header from the centre of the box is close, but misses to the right. Assisted by Dries Mertens with a cross following a corner. Corner, Napoli. Conceded by Silvan Widmer. Attempt blocked. Dries Mertens (Napoli) right footed shot from outside the box is blocked. Assisted by Marek Hamsik. Corner, Udinese. Conceded by Elseid Hysaj. Substitution, Udinese. Stipe Perica replaces Cyril Théréau. 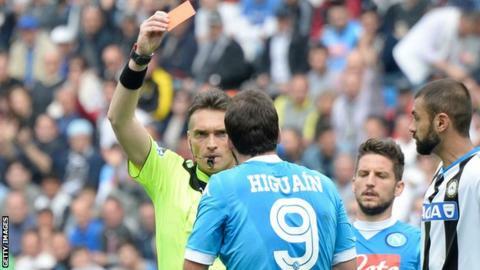 Dries Mertens (Napoli) is shown the yellow card. Dries Mertens (Napoli) has gone down, but that's a dive. Attempt saved. Omar El Kaddouri (Napoli) header from the centre of the box is saved in the top centre of the goal. Assisted by Dries Mertens with a cross. Omar El Kaddouri (Napoli) wins a free kick on the right wing. Foul by Ryder Matos (Udinese). Silvan Widmer (Udinese) is shown the yellow card for a bad foul. Manolo Gabbiadini (Napoli) wins a free kick on the left wing. Bruno Fernandes (Udinese) is shown the yellow card for a bad foul.